Hello from Gamescom everyone! It’s always a treat to head out to Germany and show our latest project to media and fans from all over Europe. Earlier today, we revealed a new trailer for The Last of Us, which we edited specifically for Gamescom. Set to a fitting and haunting track by Hank Williams, Sr., this new trailer mixes previously seen content along with some brand new cinematic and gameplay footage, to provide more detail of the beautiful environments and dangerous opposition Joel and Ellie will face on their journey across the United States. Take a look. I’ll be here for a couple days with Troy Baker and Ashley Johnson, who play Joel and Ellie in The Last of Us, as they reveal more about the acting process to press from all over Europe. If you’re at Gamescom, be sure to hit the convention floor to get your eyes on our E3 demo. As for Uncharted 3, please announce bundles for the latest head times. Please. :( I want ’em all and can’t just pay $50 for head pieces! So 90% of this game consists of beating people to death with steel pipes? Why does everything have to be so viciously violent in the video game hobby now, with no apparent morality or redeeming social values? Not sure I’m interested in this game any more if that’s the case. Hopefully it’s just the marketing department giving a bad impression. For example, do you get the opportunity to gather survivors together in a positive way to try and rebuild the world? That’s the kind of post-apocalyptic game I’d like to play. I still can’t believe how good this game looks. Watching that demo at E3 left my heart racing with how intense it was. This is a must buy. Hats off to whoever cut that video. Having Ellie hand Joel the cassette and play that music over everything was brilliant artistic work. Goosebumps! I’m trying to go full blackout on Last of Us because I don’t want anymore spoilers but I have to say this Gamescon trailer was the best trailer I’ve seen in a very long time, much better than any “real” movie trailer. Kudos to your editors. The music made all the difference. It really looks amazing. It’s quite amazing how Naughty Dog’s teams can achieve this level of quality even in just a trailer. As for what @3 said, I guess we’d never really know how people would react in a post apocalyptic world. People tend to just look out for themselves in desperate situations and when it comes down to it, I wouldn’t trust a stranger with my life when I have something of great value to them. Maybe violence isn’t something you are keen on, but I advise taking it with a different mind set then it being mindless violence. It’s okay if a game like this isn’t your cup of tea, but all video games are led by some sort of artistic vision and emotive power inherent in interactivity. A lot of questions come to mind when I watch these videos. Ellie has this sort of apocalyptic version of stockholm syndrome where she doesn’t know anything about the way the world was before so death doesn’t strike her in the same way it would you or me. Why is getting Ellie moved worth killing all these people? How will I treat the hostiles differently at #25 instead of #1? Will my psyche change a little? I’m just trying to say that I doubt the game designers approach a project where they want to romanticize killing. They’re artists. Interactivity provides them a different opportunity from watching a movie or erecting a sculpture. If you feel something and see the world a little differently, maybe with a different perspective, it’s worth a little violence. The world is full of it. Why shy away from something so inherent in the human condition? Looks like the greatest game ever! Behind great art through history is almost always an underlying spiritual, political or social message or moral. Unfortunately that kind of stuff is missing from most video games and that’s why the rest of the world still doesn’t treat games as real art. The gaming industry needs to realize that art does not just equal gathering together 100 level and character designers to draw pretty pictures of people beating each other to death in nice environments. There has to be something deeper than that. Journey came the closest to that this year, and that’s why Jenova Chen is now so highly regarded in this industry. I’m not seeing that kind of “art” here, or a vision that’s particularly creative or compelling for that matter either. But I’ll withold further judgment for now while the Sony marketing department puts together something that shows off the intellectual or real artistic merits of this game. also in this universe it’s been 20 years! Joel was a young man when this all started! if that was going to happen it would have happened long before Joel took this girl with him. This game will be incredible. While i was a big fan of jak on ps2 I never really liked uncharted or understood the fuss about it. that being said, naughty dog, I am very excited to see how this turns out, and I hope it follows Read Dead Redemption with the weighty themes being tied into the characters and the story. this game will be sick . cant wait. At first, while watching the first few seconds I though I was watching live commercial lol XD. Great job ND!!! Each time I see it It makes me want to play RIGHT NOW loll Cant wait! HEY GREAT TRAILER I REALLY LOVE IT! CANT WAIT FOR THE GAME ANY WORD ON A DEMO? LET US KNOW MORGON THANKS YOURN DOING A GREAT JOB! THANKS! I’m at the point where its very hard to avoid analyzing this game frame by frame lol. I want to go into this game with ZERO insight. From what I seen at E3, this, and other previews I can say with absolute certainly that this is most likely game of the year 2013!!! Naughty Dog rocks. Just gimme a release date and I’ll go pre order this game already. thanks Naughty Dog for caring so much about those who buy you games! Superb trailer. Much better than some directors in Hollywood. WOW…and yes, probably GOTY. Can’t wait to buy this, I don’t buy a lot of game but I bought Uncharted 2 and 3 and I’ll buy this. I hope the RUMORS of the ONLINE MODE of this game being a kind of persistant word in wich you have just one life (if you die you restart from “zero”), some bullet and just a little food and “bandages” and you have to survived and find ammos and bandages…and other players can be with you, help you or kill you or even let you die by “zombies” and wait to get your ammos and food on your dead body and all…if the multiplayer mode is really this kind of ambiance not focused on a “versus mode” or on non-stop action then, it could be ONE OF THE BEST GAME EVER with those graphics, animations and controls and all. AAAAAAAAAAAAAAAAAAAAAAH i can’t wait fot this game!! love naughty dog <3 and sony! It looks pretty promising… I think I would definately buy it! One thing thank for the new trailer of the game and I can’t wait to play the demo when it comes out, i like the music in the trailer. Wow. I can’t wait for this. im tired of seeing great PS3 games not being supported by the Playstation community. This game has the potential to deserve multi platinum day #1 sales. Lets go my PS brothers and sisters……..support these fantastic PS3 games so that SONY can continue developing more games like them. This is the number one game on my radar and has been since E3. Uncharted is my favorite series this generation and I have high hopes for this game. This game might even be better than Uncharted and if that is the case then Naughty Dog, you guys are gods. Can’t wait for this game and keep making the best games on the planet. Not sure if… reta.rded or HERP A DERP. This is an apocalyptic game…. survivors are not going to gather together and sing cunbaya. They will fight for survival and even kill as the majority of humanity will do. If that’s the way of thinking on surviving a crisis like in this game, u wont last a minute… as a matter of fact a minute its too much. BTW: This is a game for adults with a mature theme and a cruel realism…U want games u can hug and kiss go play other thing, not this game. I really loved th AI mechanics for the last of us! I have nave played a game set in a post apocalyptic environment (other than motor storm apocalypse) that allows you to plan out ur strategies according to the situation u are facing? So I guess I don’t need to say that the last of us will be in my ps3 1. Hour after the midnight launch! 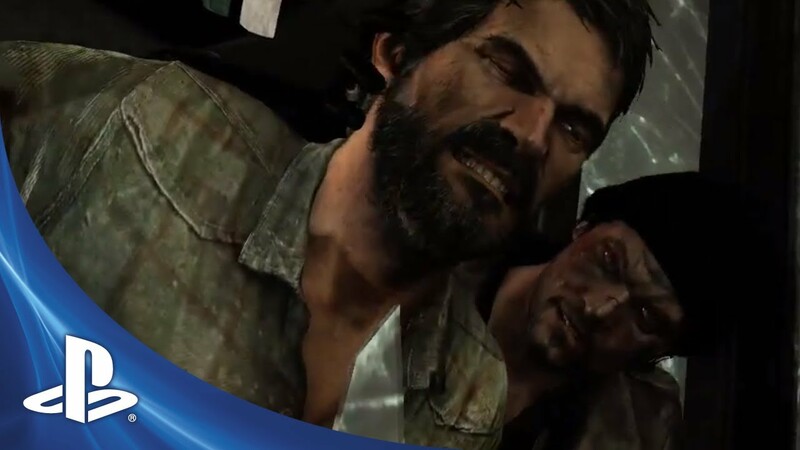 I give the last of us my thumbs up!???? This game WILL be A+, no demo needed for anyone who knows what Naughty Dog does. I like how ND haven’t been focusing, primarily, on the infected but more on the humans. Gets you more emotionally involved. Cool. The end is coming.